A 1937 solid brick colonial style house sits in the middle of a triple wide city lot in Richmond's Northside. Interestingly, this tract of land appears to be a remnant of a much larger old estate having been subsumed by the city grid. 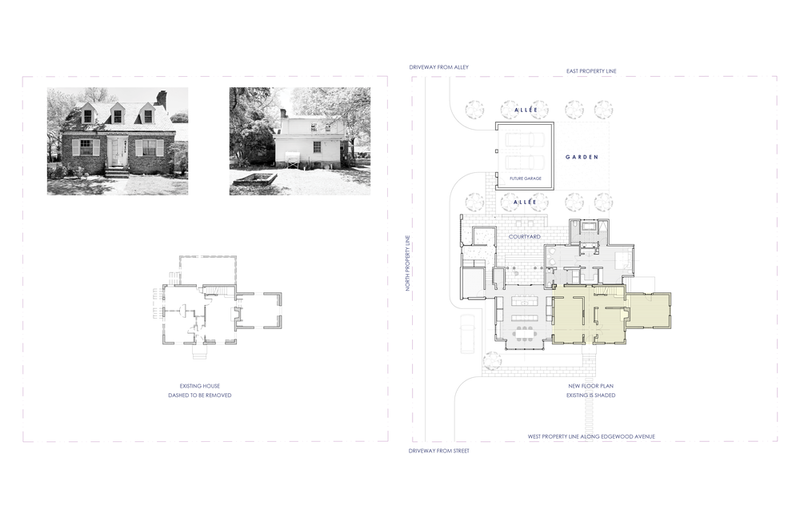 Abandoned and neglected for decades, the new owners - a Doctor and a retired former member of the Virginia House of Delegates, have commissioned its restoration and modern addition which will nearly double the size of the existing house. The couple has just sold their much larger 1929 Georgian Revival home only blocks away, and plans to retire here in spaces designed for single story living. A detached rear garage is designed in the form of an historic carriage house commonly found in Richmond's urban neighborhoods. Tree allées, outdoor rooms, and gardening spaces are woven into the plan composition. Much of the addition will be comprised of fiber cement claddings, and tall windows, but brick is chosen for the side adjacent to the closest neighboring lot where it is used both as a thin transparent screen wall and as a thick wall with projecting headers. An opaque white limewash will be painted over the new and existing brick house. These timeless details originate among historic Virginia vernacular traditions.